Carmona PDAO Department Head Ms. Rosebelle L. Mercurio initiated the Leadership Training for PWD leaders in every barangay last 1 and 2 October 2015, as part of the improvement of Persons with Disability Organization. The purpose is to motivate and boost the morale of all PWD leaders to help them develop programs for their communities. Ms. Mary Janet Peña, ASP Dasmarinas President and speaker, had launched a number of empowerment seminars for parents, professionals and students that imparted methods and techniques in the intervention of children with special needs; had facilitated multiple family support group meetings in different places to provide information and counseling to parents, especially those with newly-diagnosed children; and had been instrumental in organizing events for special children that offer opportunities for socialization, self-expression, skills development -- sports, music, arts, among others. As part of the seminar proper an early “pampasigla” was performed by Ms. Jan. She started and encouraged all participant and staffs to join her, dancing. We are surprised because we found out that Ms. Jan is a very good dancer. For the communication exercises – getting to know each other. All participants were properly instructed to move around to choose any object (symbol) in the surrounding which they can associate with individually, as reflects their present characteristics as persons . Then, each participant moved around again to pair with four other participants from other groups to share his/her symbol and explain why this object was chosen. Sharing of the symbols was a simple way of opening up one’s self to others, an important first step in establishing rapport and communication lines among leaders. On the Leadership exercises – Sport Groups (game): This is an activity composed of 5 groups facing each other. Each group had a particular action sport to execute in a contest of leadership, unity, presence of mind and speed. From this activity we were able to draw the qualities of an effective leader, as well as expectations from the members. TELL-A-VISION. 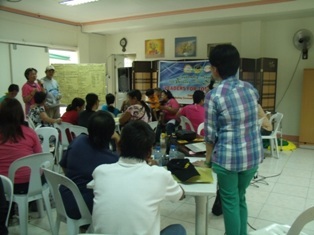 The last activity for the day led the participants to draw their vision of an ideal barangay community based on what they deem as an ideal living condition and environment where persons with disabilities can share and enjoy the comfort, peace and opportunities with the non-PWD members of the barangay. The participants’ artistic output on Manila papers were revealing of their concrete aspirations for the well-being of the PWDs in the community. It also guided them to create and prioritize plans in implementing priority services and worthwhile socio- civic endeavors not only for PWDs, but for the entire barangay community as well. Film Showing – “APOLINARIO MABINI: SUBLIME PARALYTIC”, with Ms. Mirana Medina. It is an advocacy film that shows the realization that even they are a person with disability they are still capable to work and still effective not only in their families but also in the society. Also there is some point in time that their hard work and eagerness to do their individual tasks in the community are of worth and have a fruitful outcome. In the afternoon, the participants engaged in an exercise in planning for improved livelihood in their respective barangay clusters. Ms. Jan presented a simple business planning guide that helped the leaders to concretely draw down the objective or purpose of their respective livelihood project, projected income, capital, raw material, equipment and labor requirements. This helped to assess feasibility, profitability and productiveness of the livelihood project. The reporter for each cluster group presented and explained their individual plan to the big group. Some groups were found to be without profit, some groups with break- even profit only and some yielded good result. In this activity, Ms. Rosebelle Mercurio of PDAO advised and encouraged the leaders to either improve or reform their on-going livelihood. As a whole, our resource speaker Ms. Mary Janet Pena is great all that she said, instructed and discussed during the seminar proper was very effective and interesting. All leaders participated in all activities they told them to do.